In general, this has no use, except that it lets me communicate with people when I’m somewhere that’s not good for cell phones. Hang gliding is one of those cases, so this summer I’ll be able to legally communicate with fellow pilots and chase drivers. Hooray! An artistic woman saw my post about putting Louis to sleep, and she wanted to sketch my picture of him that was taken an hour before he died. Her sketch is really good, and it captures Louis’s habit of laying his head on my arm far better than the photograph does. This morning, I attended the inauguration viewing on Berkeley campus. It was amazing, with a tremendous crowd that cheered for Obama, laughed at Bush, and booed and hissed at gay-hater Rick Warren. I’m sure there’ll be pictures on the news (or at least some dude’s blog) somewhere–there were plenty of cameras out, so I didn’t bother to take any pictures. The one thing that really changed the mood of the ceremony, though, was the presence of subtitles. Oh, the subtitles were welcome enough, but evidently the C-SPAN employee in charge of subtitles was an idiot, and he comically flubbed several lines. Better yet, when Rick Warren (boo) said that “Dr. King and a great crowd of witnesses are shouting in heaven,” the subtitles read, “… witnesses are shopping in heaven.” Now, that’s just messed up. I don’t understand how anyone could mishear that phrase in that way. 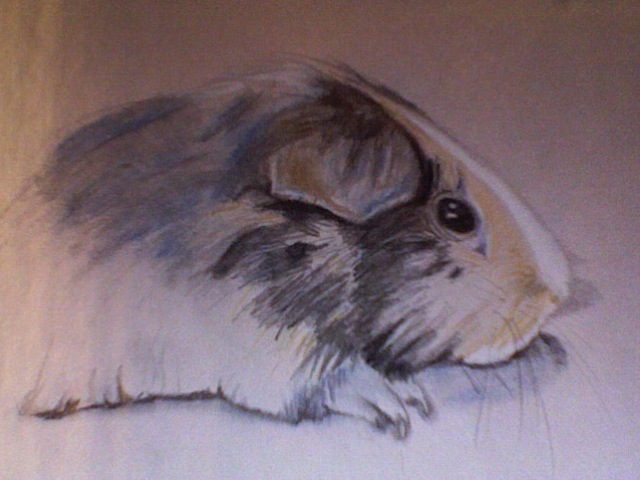 Screw dreaming of genies; I dream of guinea pigs. I won’t bore you with the whole thing, but suffice it to say that all three guinea pigs were present, and it didn’t occur to me once that two of them are dead now. I’m not sure what it means, but I can still imagine Louis with a fair amount of clarity. I know it’ll fade in a few months or years, but for now I rather like that clarity of memory, which is unusual for me. Also, in the dream, Chester jumped around and climbed from one part of the cage to another, and I was impressed by the quality of my internal representation: it’s exactly the way he does jump, walk, and lie down in real life. The human brain is a magnificent pattern-learning machine. I forgot to put meat (which I bought specifically for stir fry) in my stir fry. That’s indicative of something; I just don’t know what. I’m back in Berkeley after nearly 4 weeks in Tennessee. It was a pleasantly long break, and I did only the bare minimum of work. I cooked a lot with my brother Sam, even making fudge with my mom’s guidance. That was useful for my parents, in part because…. Now, I should probably tell you that my mom has multiple myeloma, a sort of marrow cancer. I’ve been avoiding telling people because I don’t want them to see me as needing their support. I mean, what can people do? 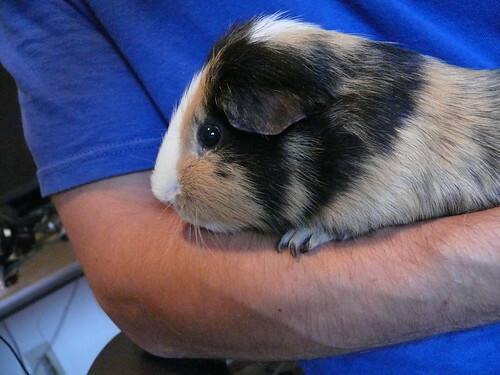 But it turns out they can do a lot, in particular taking care of my guinea pig Chester while I was gone. Thanks, Chung Hay, Todd, Cheryl, and Ryan! So, my cooking was useful because my mom, with her low blood counts, wasn’t allowed to use a knife, and that means my dad has been doing most of the cooking, so our help with that was probably useful. Now that I’m back in Berkeley, I’m aiming to graduate by the end of the summer. I think I can do it, but it will require substantially more effort than I’ve been putting in so far. For the forseeable future, I’m officially declaring Sunday a weekday. Onward and upward!